Apartment located on the first floor of a secured and fenced building with private entrance. One Bedroom apartment with queen bed, 1 bath and one large convertible bed ( Queen size). 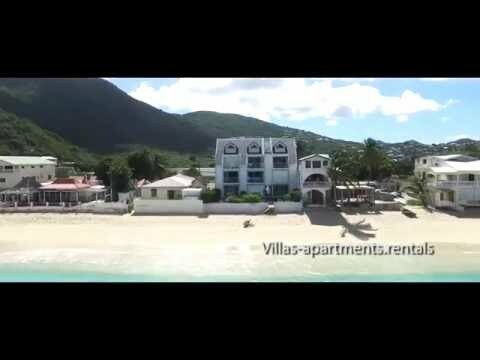 This apartment is a high scale apartment located on the Grand Case Beach, close to many shopping boutiques, gourmet restaurants, and close to Orient Bay. The « One-Bedroom Apartment first floor up to 4 guests » is an apartment directly located on the gorgeous beach of Grand Case, the gastronomic capital of the Caribbean. This apartment is in a perfect location for a family to enjoy a romantic escape right on the waterfront. Walk into Grand Case along the beach for gourmet restaurants, beach bars and nightlife. The interior is furnished and has a lounge area with flat screen TV, air-conditioning & ceiling fans. The kitchen enables you to enjoy meals at ‘home’ when you prefer just to be alone together. The dining area also has a large comfortable sofa bed to relax and enjoy the stunning views.